LAS VEGAS. IBF/WBC lightweight champion Mikey Garcia predicted that WBA welterweight champion Sen. Manny Pacquiao won’t knock out challenger Adrien Broner in their fight at the MGM Grand Garden Arena here this morning (Manila time) because the challenger is too smart and too defense-minded to get caught with a big punch. Garcia, who was once being considered to fight Pacquiao, is moving up two weight classes to take on IBF welterweight titlist Errol Spence, Jr. on March 16. There is talk that the winner of the fight will be next in line to face the winner of the Pacquiao-Broner bout unless Floyd Mayweather, Jr. cuts in. Garcia said he’s wondering if the real Broner will show up for the fight. Broner has been known to lack discipline in training and thrice, lost titles on the scales for not making weight. In 2010, he was eight pounds over the limit and was stripped of the WBC Youth Intercontinental superfeatherweight crown before his fight against Guillermo Sanchez. In 2012, Broner was 3 1/2 pounds over the limit and lost the WBO superfeatherweight title on the scales although he went on to stop Vicente Escobedo in the fifth round. In 2016, he was 1/2 pound over the limit and his WBA superlightweight belt was taken away at the weigh-in even as the fight against Ashley Theophane continued. Theophane was stopped in the ninth round. 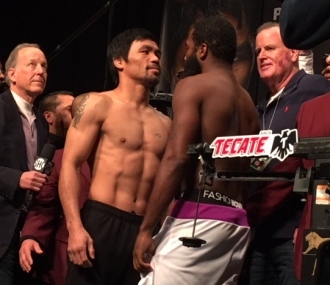 At the weigh-in last Friday, Broner scaled 146 1/2 pounds to Pacquiao’s 146. It wasn’t clear if Broner took his training seriously at West Palm Beach under his father-figure Mike Stafford and lead trainer Kevin Cunningham. Broner was heavier than 146 1/2 by 1/4 pound when he beat Paul Malignaggi via a split 12-round decision in 2013 and also weighed 146 1/2 pounds when he pounded out a split 10-round verdict over Adrian Granados in 2017. The indication is Broner doesn’t seem comfortable fighting as a welterweight. Stafford said if Broner wanted to drop down to 135 pounds, he could. Broner has fought as a welterweight in seven of his 37 bouts and registered a record of 4-2-1. Two of his four wins were by split decision so it appears Broner, who’s probably a natural junior welterweight, struggles in the 147-pound division. For him to weigh 146 1/2 pounds could mean he’s not in peak form. As for Pacquiao, he’s never weighed more than 147 for a fight and scaled 146 in his last fight where he stopped Lucas Matthysse last July.